The longer Fabian and I have lived in our home, the more we love it. I am currently working on a few design projects around the house and promise to share photos soon. Our house has been really great for us. We have four bedrooms and plenty of space, but I only have two full baths. The thing I constantly find myself wishing for is a little powder room that I can go to town on design-wise. 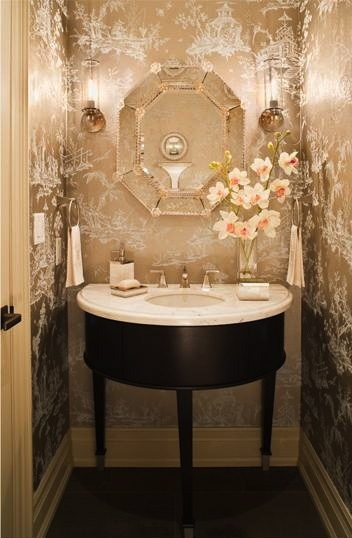 I wish I had a tiny little bath that I could dress up in a fabulous wallpaper combined with a gorgeous mirror, classic sink, and some beautiful lighting, of course. While I gravitate most towards the stunning powder bath above—I just want an excuse to use Scalamandre’s iconic zebra wallpaper, I love all of the powder baths in this round-up. Which of these powder baths is your favorite? Is there a specific type of room you wish you had in your own house? I love when a patterned curtain matches a patterned wall! What a classic. And it's always hard to go wrong with Scalamandre wallpaper...! I think in the last one, what you're seeing is a sconce mounted on the mirrored wall, and then the lantern reflected in the mirror. :) It would be a little strange to put those two right next to each other! I love the last pic! Minus what you said about the light?! It looks so weird..You can tell the wall is mirrored with everything else except there is no reflection of the lights...maybe a bad photoshop at some point!? Ok, I think I understand what's going on in the last photo now. The whole wall in the foreground is mirrored. The sconce is hanging pretty high up, but the illusion from the mirror makes it seem higher than it really is. The lantern isn't next to the sconce, but rather hanging on the ceiling near the toilet area. Does that make sense? My eyes were playing tricks on me! Thank you so much for including New Ravenna Mosaics in your powder room feature! We are thrilled to be seen twice, in the colorful Loom ikat and the Honeycomb in Tiffany Eastman's neutral bath. We are big fans of the Fabulous Room Friday posts as well here in the studio...Happy Tuesday! It's so important for a powder bath to have a great mood about it - guests enter there and one would like to think they leave feeling more beautiful and uplifted than when they entered. The Gluckstein Designs powder bath cocoons the guest in elegance - it's my favorite. Ooh. I love those. The only thing I don't like about my new 1920s home is no powder room. At least I can live vicariously... Sigh.